It's Fyberspates Ethereal Cashmere Silk 4ply which came from the '£5 tangled hank' Lucky Dip and I do indeed feel lucky - it's lovely! (It was accompanied by an actually tangled hank of Faery Lace which at 1200m is more useful, although not half as pretty.) 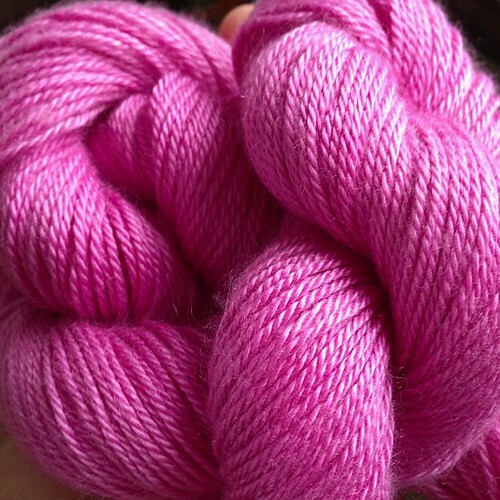 So now I'm wondering what to make with it - it's 50g which should be about 200m, so enough for "a little something". It's time to think about the next Knitalong - a few people have asked what/when etc, so I'm 'putting the feelers out'. I'm currently torn between socks (I'd like to try two-at-a-time-toe-up socks) or another shawl... what do YOU think? There'll be a Flickr group this time - so those not on Instagram can post their pics too. If you're likely to join in, please leave a comment below and let me know what you fancy making, and anything else you'd like to say about it. Thanks. Is it mere coincidence that I bought the two-at-a-time-toe-up-sock book a couple of months back and put it in the 'for 2013' pile? Actually, I am going to tackle them next regardless....I have loved the two shawl knit-alongs, and would happily do another. Looking forward to hear what everyone else reckons. I am interested in two at a time socks--but a little afraid too. I have never done *any* sock knitting and am afraid this method might be a bit too much for someone like me? If you choose a shawl, I would be interested too--but only if it was a full size shawl as I am not a big fan of most little shawlettes--they always seem too small and hard to wear! Love the pink in your posted photo! I like the look of that cashmere. I never wanted to knit two socks at a time. But ... Why not give it a try. It alsways nice to have company. I have the book (in German). If you decide on a sock knit along, I will save my special yarn from you and join in - I still haven't decided on a pattern worthy of it yet though!